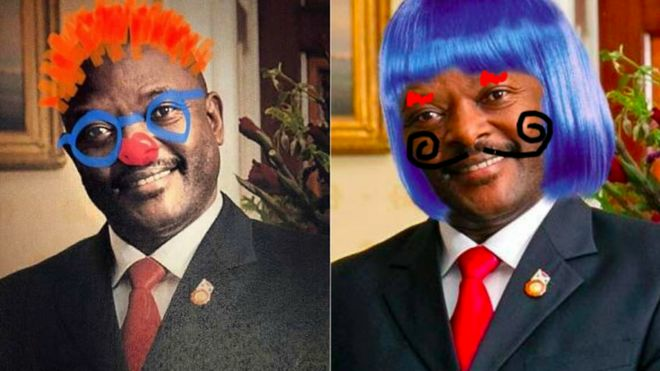 People across the world used Twitter to rally to the cause of three schoolgirls arrested for defacing photos of Burundian President Pierre Nkurunziza by repeating the ‘crime’ the girls were accused of committing. The world could not understand why dictatorial Burundi is still detaining the girls for charges of doodling on the president’s photo. Therefore, twitter users used doctored images of Mr Nkurunziza to mock him and demand the release of the girls. Crudely doctored images of the leader are being circulated online under the hashtag, #FreeOurGirls. The girls were charged last week with insulting the head of state and could spend up to five years in prison. Burundian authorities are routinely accused of cracking down on human rights and dissent. The schoolgirls, aged 15,16 and 17, were arrested two weeks ago after the president’s image was defaced in textbooks. Four other students arrested with them were later released. I won't shut it: #FreeOurGirls! Here are some of the images that have been circulating online in support of the girls. “Authorities should focus on holding perpetrators of serious rights violations to account instead of jailing schoolchildren for doodles, the group’s Central Africa director, Lewis Mudge, said. In a similar case in 2016, several schoolchildren were imprisoned and hundreds expelled for scribbling on images of the president’s face.